I have a lot in common with the Bundys. Here’s what I’d like to say to them. Like the Bundy brothers now illegally occupying the Malheur National Wildlife Refuge near Burns, Oregon, I'm a lifelong rural Westerner, and I believe that if I were to talk with them, we'd most likely find we have a lot in common. There's the way our lives were shaped by the land, for instance. I was born in Nevada, and I grew up and now live in southwestern Idaho. Though my family worked as carpenters, we lived on small farms where we raised cows and grew hay for the winter. Like the Bundys and many of their allies, I come from hard working, blue-collar folks. From them I learned to love the land, especially the Northwestern high desert. I've hunted the uplands of eastern Oregon from Juntura to Rome, and from Leslie Gulch to the Imnaha. Much of that country is open range where cattle graze. Thanks to ranchers, I've watered my bird dogs at troughs where ranchers had enhanced a spring, benefitting both cattle and wildlife. A group of mule deer bucks moves across Malheur National Wildlife Refuge in Oregon. There is no big game hunting on the refuge, so deer abound. I imagine that if the Bundys and I sat down over coffee, we'd start trading stories about our early years. Pretty quickly, though, our differences would emerge. They'd insist that taking over a wildlife refuge is speaking for "the people" – Westerners frustrated by the federal government. I couldn't let that stand. Want to read more of our coverage of the standoff and what led to it? Find it here. I'd respond by saying: That wildlife refuge you're occupying belongs to me and to 320 million other Americans. You are trespassing, taking advantage of the hospitality and tolerance of the rest of the American people. You are abusing the rights you so readily invoke by occupying the refuge indefinitely. I would remind you that you are free to stay a maximum of 14 days, because that is the camping limit in most places, and it was put in place so that everyone can share the land. If they let me continue, I'd suggest they go home and read Civil Disobedience by Henry David Thoreau and perhaps brush up on their history about Rosa Parks, Martin Luther King Jr. and the civil rights movement. Parks didn't wave guns around and threaten to kill people on the bus. Then I'd say: "You are carrying firearms and threatening to commit violence if you don't get your way. You say you want this to be a peaceful protest, but in the same breath you warn that you will fight and die for your cause. You bluster, trying to provoke a response, all the while using the media to protect you and further your cause. "You are abusing your rights as an American. There are legal ways to change systems if you feel that they aren't working. I have heard nothing from you about your responsibilities, only demands about what you want, though ultimately, what you want is to control a resource that belongs to me and to every other American. Public lands are our birthright, and you have no right to commandeer them for your own purposes. "Frankly, I don't want my land – which includes all the federal land in the West – turned over to people who behave like you. I want to be free to hunt, fish, hike, ride my horse, my mountain bike or all-terrain vehicle, to picnic, camp, and to bird watch on the nation's vast tracts of federal ground, and I don't want to have to ask for your permission to do so. "Your protest is nothing more than an elaborate tantrum conducted with firearms. If you actually won claim to any public lands, I think you'd intimidate and bully others the way you and your followers did in Nevada, and the way you are doing now. Furthermore, your family owes me and 320 million of my fellow Americans more than a million dollars in back grazing fees for using public land without paying your fair share. "When I cut firewood on nearby Forest Service land, I purchase my 10-cord, personal use permit. I pay my camping fees. I buy my hunting license. I pay to park and use ramps on wild rivers where I kayak. I pay fees because they are used to improve recreation opportunities for everyone. So I want you to go home and start paying me and your fellow citizens what you owe us. That's what good citizens and neighbors do. Thanks for the conversation." 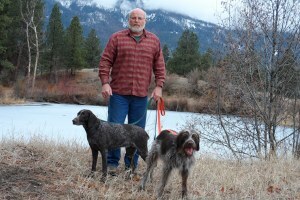 Chris Dempsey is a contributor to Writers on the Range, the opinion service of High Country News. He lives in Idaho.